Copperloy railboards are designed to connect your dock with a railcar. Our unique railboard design features a rugged under-brace which fits your loading requirements for safe and positive positioning. 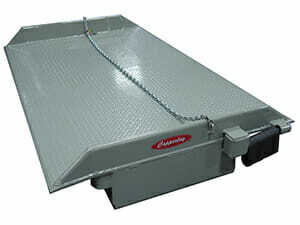 Each rail board is specifically engineered and designed to meet the dimensions and specifications for each dock site. Several design applications are available including rectangular, flared, refrigerator car, car to car and plug door cars. 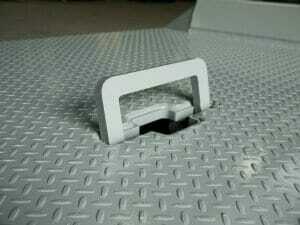 Our non-slip high strength plate decking ensures additional safety while using our rail boards. Come standard on all rail boards. 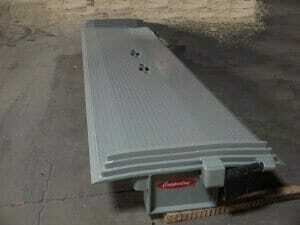 Located 24″ from approach end of railboard to accommodate different fork sizes. Available in 1 or 2 piece. Center hooks disconnect during use.